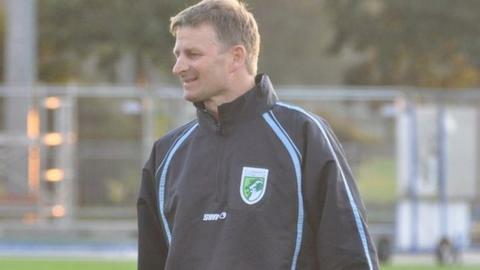 Guernsey FC boss Tony Vance says his side's FA Vase fourth round tie at Rye United will be a "huge challenge". With poor recent weather the Green Lions have played only once in the past six weeks as they prepare to face the Sussex County League Division One side. "It's a huge challenge, a different team and a different league," Vance told BBC Guernsey. "In this competition it's a different level because of the dream ticket at the end of it." in their last match two weeks ago and Vance says he is hopeful his team will not be too rusty. "We're going to have to put aside the fact that we've not played and hit the ground running," he continued. "We just want to try and get a game of football going and win in the 90 minutes if we can. "We're training hard, we're trying to incorporate some match situations in training, but nothing beats a game. "In the last game we played we were off the pace and weren't fantastic but we managed to nick a draw in the end," Vance said. Guernsey will be without Simon Geall, but Ollie McKenzie and Jacques Isabelle are available for a side Vance admits he knows little about. "With the weather we haven't had a chance to watch them," he added. "I know they were at our last game watching - we weren't fantastic that day so that's probably a good thing. "It's easy for them to come and watch us when we're on our travels, but there's a stretch of water in the way for us. "